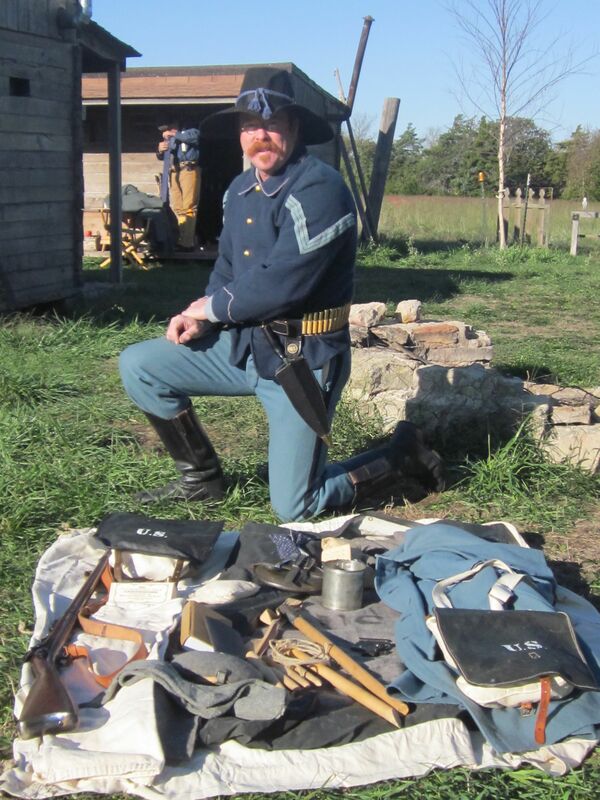 It has been requested that I start a post detailing the kit I wore and carried at the 2012 Grand Muster at Garnett Kansas. Having found my entry for the field uniform contest I will post it here. I am Sergeant Jerry M. Davenport, a senior NCO in Captain (And Bvt. Col.) J.J. Coppingerâ€™s Company â€œAâ€� of the 23rd U.S. Infantry. It is November 1876 and I am stationed at Fort Hartsuff Nebraska. I am the post saddler. I was assigned this extra duty last May to replace Sgt. William Dougherty who was killed in a skirmish with Sioux Indians near Gracey Creek. This skirmish has become known to the locals as the Battle of the Blowout. My duties include making any necessary repairs to our company leather goods as well as overseeing the care of the horses and mules used here by our company. I have my own quarters in a corner of the stables that doubles as my workshop. Colonel Coppinger and Captain Miles Keogh were close personal friends. Both were Irish members of the Swiss Guard at the Vatican before immigrating to the United States. Since my uniform is the regulation uniform and accoutrements of a U.S. infantryman and composed almost entirely of original or museum quality specimens, I will briefly outline the deviations from regulations and the reasons behind those deviations. While official superseded by the M-1876 campaign hat, mine is the M-1872 version of the Andrews Hat. This is because on June 16, 1874 Congress stipulated that no new pattern items be issued, â€œâ€¦until those on hand are exhaustedâ€� Since there were still some of the M-1872 hats on hand when I needed a new one our quartermaster, Lt. Charles Heath Heyl issued me one out of our storehouse. Photographic evidence shows that they worn as late as the early 1880â€™s. The judges will note that while most men â€œlooseâ€� their issued hat cords I am wearing mine. It normally stays in my footlocker so that I am not charged for a new one, I only put it on my hat on such occasions when I know I will be inspected..such as today. Again my great coat has been officially superseded by the double-breasted coat formerly worn only by the cavalry. A shortage of these forced Secretary of War E.D. Townsend to issue General Order No. 67 on June 25, 1873 that stated in part, â€œuntil further orders, the single-breasted overcoat; â€¦may be issued to and worn by, enlisted men of all arms of the service, in lieu of the double-breasted overcoat.â€� I have removed the hooks and eyes from the collar of mine as they have a tendency to become caught in the beard I wear in the winter months. I have also replaced the lining with cloth from a condemned blanket. This practice can be documented in the book My Life on the Plains, by G.A. Custer and The US Army In The West, 1870-1880 by Douglas McChristian. There is no regulation pertaining to the suspenders and my wife made me a pair from blue ticking material. I am wearing the unlined version of the M-1874 5 button blouse. While normally only issued to mounted troops, M-1872 mounted boots such as the ones I am wearing have been proven by archeological evidence to have been worn by at least one infantry soldier at Fort Hartsuff. A photo of this boot accompanies this entry. Archaeology also shows that harmonicas were used at Fort Hartsuff as harmonica reed plates have been found. I am carrying my personal harmonica in my boot. Even had they not been found during the digs at Fort Hartsuff, Libby Custer mentions in Boots and Saddles that while officers forbade the men from bringing harmonicas on campaign, soldiers could easily hide their harmonica in their boot tops so they brought â€œthe little harpsâ€� with them anyway. As the judges will note that I am equipped with the M-1873 Rice trowel bayonet. This is an experimental item not normally carried by most infantrymen. My company was chosen to report on the suitability of it for general issue. This is demonstrated in the copy of the ordnance returns accompanying this entry. I am also supplied with the new M-1876 Prairie Belt. Iâ€™d also like to point out that I have chosen to compete in the Infantry class becauses my company was not issued sidearms again this can be seen in the ordnance returns. I have modified my rifle by replacing the sights so that they are the correct type for 1876. As post saddler I have made myself a second prairie belt from condemned materials here on the post so that I can carry more ammunition. In my M-1874 Clothing Bag I am carrying a spare pair of regulation canton flannel drawers, a reprint of Uptonâ€™s Infantry Tactics, my target record book, my rifle tools, housewife, and since the 1872 regulations ignored the socks, there is also a pair plain Grey wool Socks of the type commonly worn during the period. I am carrying two boxes of ammunition in my clothing bag. The Judges will note that I have troubled myself to package this ammunition in a reproduction Frankfort Arsenal package. In my M-1874 type I haversack I am carrying a complete set of M-1874 silverware, a M-1874 type II meat can, Hardtack, beans and coffee. I had always thought that 1876 was too early for the type II meat can to have been issued; however, I recently read that one was found at the archaeological digs at the Little Bighorn Battle site. I have had my prescription put in a pair of original gold wire frame glasses. I am also carrying a pocketknife typical of the kind used during the Indian war period. While I didn't detail it in my entry. I am wearing the regulation canton flannel drawers, plain Grey wool Socks of the type commonly worn during the period, The CW period infantry trousers with M-1872 infantry Sgt. stripe, and a M-1874 gray wool shirt. 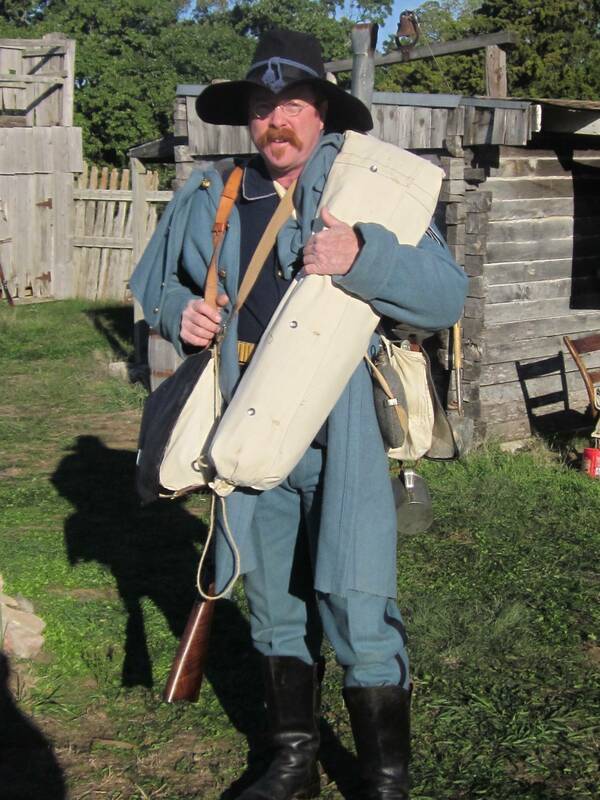 I am carrying a CW Type rubber blanket and shelter half with correct pins and pole, canteen with 1874 modifications and M-1872 bedding blanket. Re: "Ask and ye shall receive..."
Nice! !...thanks for the write. I have a couple of questions but I will post them later. A very informative and interesting read, thanks for posting it. Pitspitr...if you get a chance, can list who the vendors you used for some of the items and how they have held up? Was company A of the 23rd high on the list of new gear/trial gear issue? Since the got the experimental trial bayonet, I was wondering if they were specially selected for other stuff. The Items I use and sources are listed below. This has been a nearly 25 year journey so I may not be correct on some of the sources. If you check out the Clothing and Equipment thread (http://www.cascity.com/forumhall/index.php/topic,33884.0.html) it will have most of the address' for the vendors (some are out of business) All of my equipment has held up pretty well. I've had the shoes resoled and the damned uniform seems to have shrunk while hanging in the closet but other than that most of the repro's are going on nearly 25 years and are still going strong. Not sure what the status of A of the 23rd was in regard to testing. All I know for certain was that they tested the trowel bayonet in 1876 and did not recommend it. I never carried money but I should have thought of that. Do you know where I could access copies of ordnance returns ? Specifically for the 2nd battalion, 18th infantry for 1866 and companies G and H of the 9th infantry from 74' - 76'. Ah. I see. Interested in Capt.s Tom Burrows and Andy Burt are ye? I think I have The 9th from '74 to '76. I know I have Sam Munson's "C" company from that time frame. If I do, I'll have to scan them and turn them into a .pdf. It'll take a while so be patient but remind me after a while if I haven't gotten them done. In the one of the pictures I have of the expedition, Im sure you've seen it, of the soldiers butchering a horse? One of the them wears a sack coat or an 1874 blouse and they all seem to wear FWC's. The man in the coat has tucked his trousers into his socks. Im not sure what unit they are from. But Im basing my impression off of that as well as other research. I'm really interested in "C" Company as they built Fort Hartsuff and were transferred to Ft. Laramie just in time to take part in Crook's '76 campaigns. Some of the men of "C" during the BH&Y expedition were still on the roster at Balangiga. Balangiga, wow, I'd be interested in seeing their ranks from both periods. I understand that promotions were slow and not necessary for retention. I read that in 1885 the quartermaster general recommended issuing out the old rubber blankets to soldiers without charge, just to get rid of them, the idea was rejected though. The ponchos and blankets were deteriorating after 20 years of storage and he wanted to replace them with raincoats. I remember in late 09', when they stopped issuing field jackets, the army allowed us to draw field jacket liners and trouser liners out of stores at no charge. A friend of mine was tied with a guy for "Most Authentic" costuming. They got down to their skivvies and hand knitted socks and were still tied. Then he remembered that he had a pocket full of era correct coinage and that tipped the scales on his behalf. Best part was he was a Canuck at a US shoot! 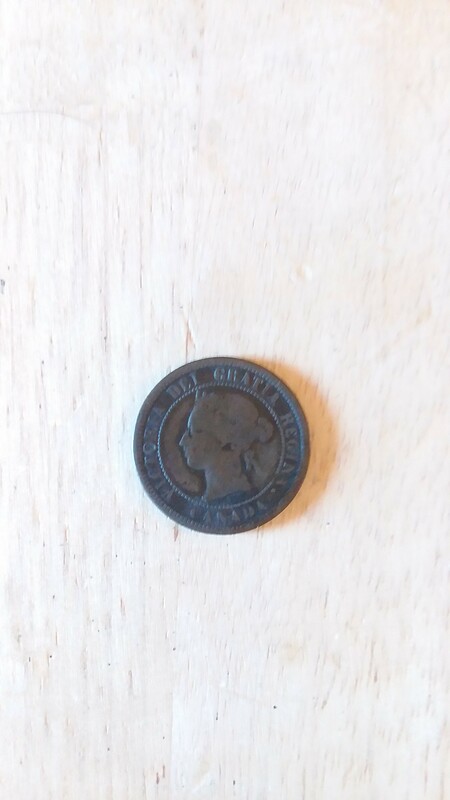 In my circa 1860-70 RE uniform I used to carry a handful of Victorian pennies as tokens of appreciation at events. They were highly prized by recipients (especially kids) and eventually I had to stop giving them away as the supply was drying up. The reason I went so far into the authenticity side on my uniform was because I was a"Fringe", or "hanger on" the old General Miles Matching and Chowder Society before they folded. Back then, being self-employed and having all my kids at home yet, I just never had the time or money to get it all done. Now that I have it all together, they are no more. When we ( I went to a couple of their events on a probationary period) had an event we weren't competing against each other or something like that, so period money was never an issue and I never thought about getting some. Most of the membership were National Park rangers at historic sites or museum curators so I still get to see them on TV every once in a while. I have a nice collection of period American, Mexican, and Canadian coins. I just never figured I would need it on campaign. It's not like you've never had a competitor reach into his pocket and pull out (Oh, say a handful of Imperial German coins) period pocket change for the benefit of a judge. I began that trick in formal contests at SASS events, with period U. S. change but I don't think I'd take the chance of doing a field impression with a gold eagle or half eagle. I don't think I would risk anything larger than a silver Dollar or two along with the smaller stuff in the field. I don't remember you ever being in a uniform contest that was that close. You usually win hands down. Considering enlisted men only made $13 a month, more than a few cents in their pocket would just be wrong! In my list I forgot to mention my gold watch and chain, however since my watch is stem wind it is too new so if I were really making sure to have my impression perfect I'd leave the watch at home. In the era, there were no "Canadian" coins. We never became a nation until 1867 and I'm not sure when we began minting our own coinage and printing our own bills. When I was an active re-enactor, the bane of my life (and that of others) were the "stitch Nazis". Most of us strove for the "10' Rule" as a standard in our impressions. The most important aspect was your demeanour, the way you conducted yourself, not the purity of your kit. I was once challenged as to the fly on my trousers - zipper or buttons, as everything else was tickety-boo. My response - "If it's that important to you, check it out." Same for wearing a kilt. When asked if i was "regimental" under the kilt, my response was: "Two kinds of people would even care about that - women and queers. You don't look like a woman to me." The other irritant was being told that my spiffy P-H Enfields and bayonets didn't look "antique". My response: "Of course not, they just came out of stores. If you want 'antique", check out the museums". I never understood wanting antiqued firearms, especially when reinacting. What do you suppose an officer would say to a private in 1873 if his brand new trapdoor looked 100 years old? 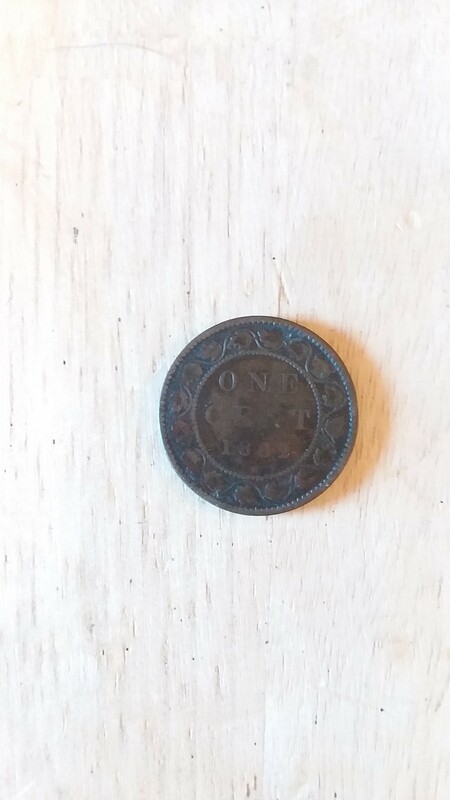 In the era, there were no "Canadian" coins. If Im correct the era goes up until 1901, when queen Victoria died. Canada most certainly had coins, they began minting them in 1870. You're right! I just checked some of my coinage. You want my Canadian penny? No, you keep it. A souvenir from a time when Canada was something other than a "post national state with no core values" (a quote from our illustrious Prime Minister, Justin Trudeau), now a nation of legalized pot heads and a haven for ISIS and other terrorist "immigrants" wanting to return to Canada after having their butts kicked in Syria. No, you keep it. A souvenir from a time when Canada was something other than a "post national state with no core values" (a quote from our illustrious Prime Minister, Justin Trudeau), now a nation legal of pot heads and a haven for ISIS and other terrorist "immigrants" wanting to return to Canada after having their butts kicked in Syria.